The Ranch to Ranch 10k is an opportunity to run on some private trails between 2 working ranches in beautiful Japatul Valley. You will start at the ranch at 22010 Lyons Valley Rd. and proceed on a trail over to Windfall Ranch, making a loop around the property and then back, heading to the start/finish line. Most of the course is single track trail. It's not considered a fast course, but definitely a FUN course. It's technical in some areas with need for attention spent on footing when you're not looking at the views. 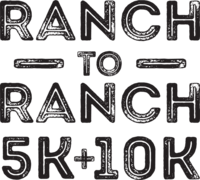 The Ranch to Ranch 5k has just been added for those who would like to come out and enjoy the trails but maybe not be out as long. the shorter course is still challenging and heads out with the 10k runners but returns sooner with a strategically placed left hand turn that cuts off some of the 10k course! No matter what course you choose, your gonna have a good day!